The 3326A has been working for several days now, with no problem, but the current repairs were only temporary, with some parts that were at hand, but not quite up to the requirements. Still, I didn’t have the service manual, and no luck on the internet, except for some companies that want to charge me 20 or even 50 USD, for a 30+ year old manual. Well, these manual dealers somehow have to make a living, but I have no dollars to give away, just to get some part numbers. After a few requests sent around to various people that might be proud owners of a 3326a service manual. Finally, some luck: a generous engineer out there provided me with a pdf copy today, of the service manual HP 03326-90010. (1) Replace the input cap with a 100n X7R, 100 Voltage rating – so far, only 50 V was in stock, but recently, a package of Kemet brand, mil-spec C430C104M1R5CA arrived, hope these will last! (2) The over voltage SCR crow-bar circuit (currently with a 1884-0261 installed, 4 Amp rms). Looking at the parts list, this needs to be a 1884-0231, a very rare HP numbered SCR. Apparently, it is a TIP116A, 100 V, 8 Amp rms, 20 mA max. gate trigger current equivalent. So the 4 Amp part currently in there might be a bit too weak. The only SCRs around are a 1200 V, 25 Amp, 40 mA max. gate trigger current. Question – are there any issues to be expected, when replacing a 20 mA max. gate current, with a 40 mA gate current part? Well, there could be. 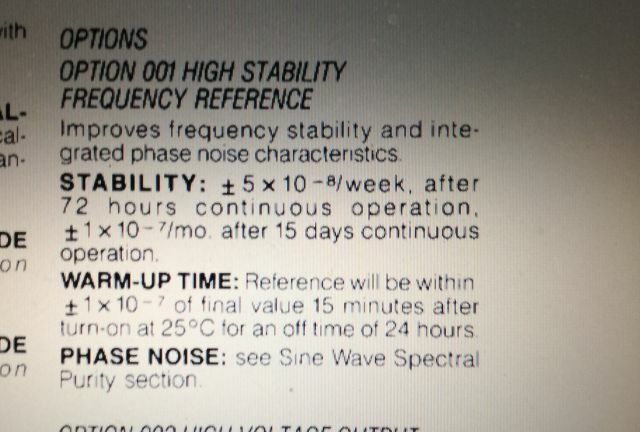 After a more careful look at the TYN1225 datasheet, there is some hope that it could work. 4 to 40 mA, that’s a large range. Maybe the part will trigger already at much lower current, given that I don’t intend to operate the instrument at very low temperatures, below freezing, where the SCR gate trigger current typically increases. 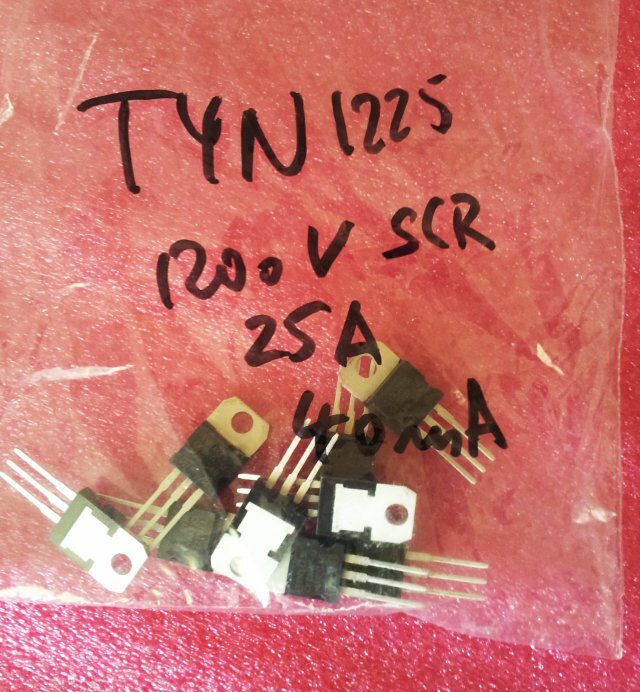 After a quick test with a power supply, a resistor, and a current source – the particular TYN1225 which I randomly picked from the bag triggers at about 4.5 mA. All should be fine. Note that the SCR is triggered via the Q800 transistor (which has been checked and found OK), and this circuit could supply well over 30 mA to the gate, if needed… also, there is connection via the mother board, so the over-voltage circuit will only work when the power supply assembly is mounted in the 3326A. Otherwise, the gate trigger will be open circuit. 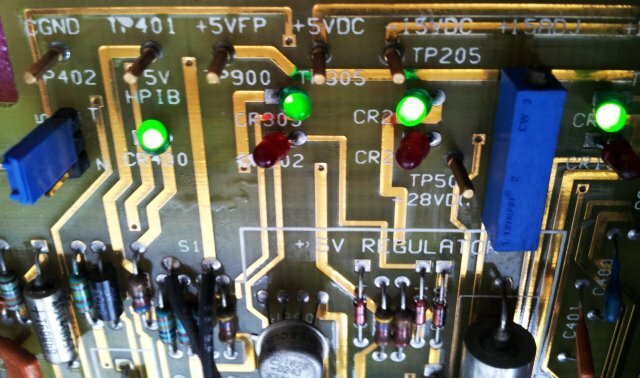 … with the SCR soldered in, the 3326A repair is now complete! 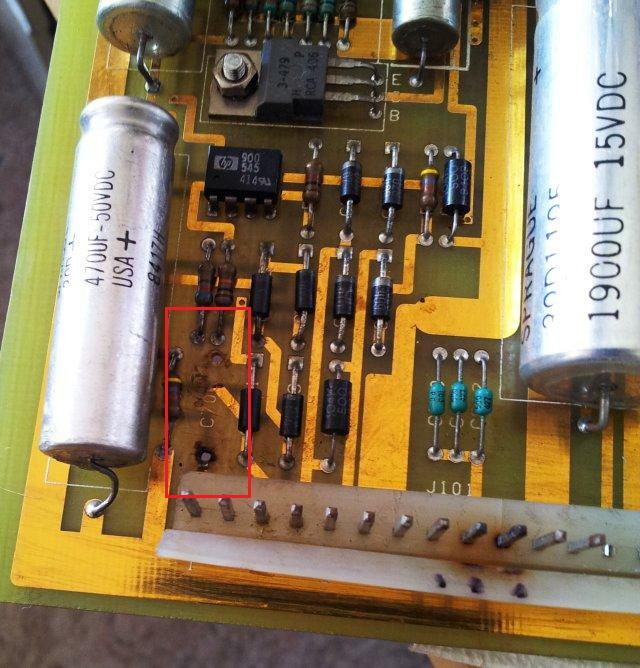 …coming back to the 3326A repair, a slight mystery remains – at one time in the past the over-voltage protection circuit must have been triggered, destroying not only the SCR, but also damaging some quite large traces on the board. Typically, the SCR is just switched on for a few milliseconds, before the mains fuse will blow, with no damage of any trace. 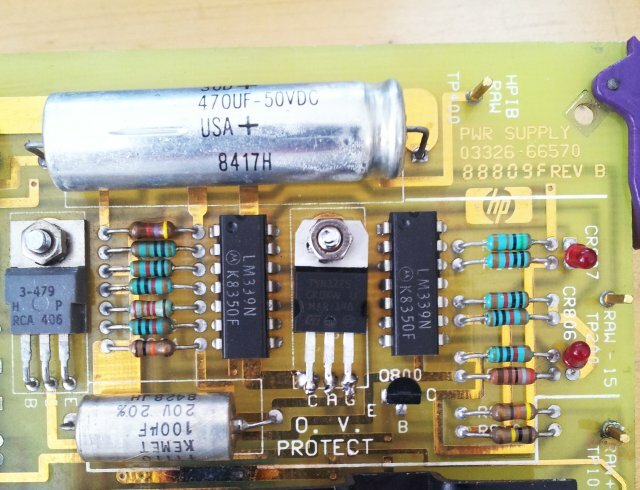 Typically, these HP devices are well engineered, so there is only a small chance that they didn’t design the system right, to the extend that power would be provided to the board for any length of time even with the over voltage protection circuit triggered. Now, the 3326A has passed a 24 hour run-in and multiple power cycles, time for the final safety check which I perform on any instrument repaired, like, checking the ground resistance, checking the isolation resistance, checking the mains fuse rating, etc. THE FUSE. SOMEONE MUST HAVE BEEN FULLY CRAZY, AND PUT IN A 20 AMP FUSE!!! 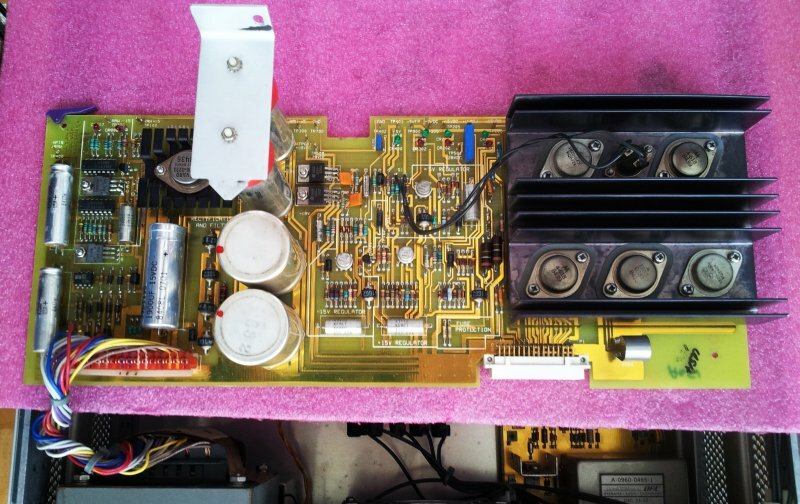 That’s why the over voltage circuit didn’t work, and presented a fair risk of fire and instrument damage, of an instrument, sold at over USD 10k, 1990 dollars. 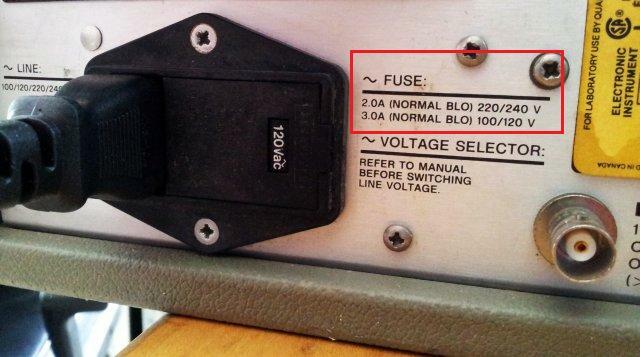 The fuse rating – 3 Amp, normal blow. And a big warning sign, hard to overlook. But what is a normal blow fuse? In the US, fuses are actually rated by the manufacturers, and standardization is well above the level of fusing time, etc. – two types are typically sold, ‘Slow Blow’, and ‘Fast Acting’. Slow blow fuses are easily idenfied, they either have the wire wound around a ceramic core, or are filled with sand. 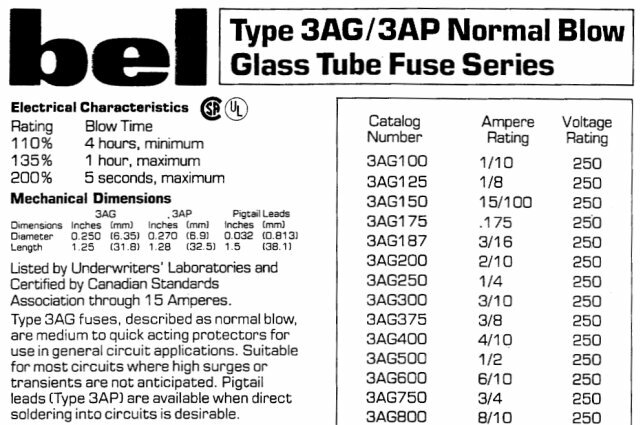 Found this document, related to ‘normal blow’ – as it turns out, these fuses are actually identical in rating to the typcial ‘Fast Acting’ fuses that I have in stock here. 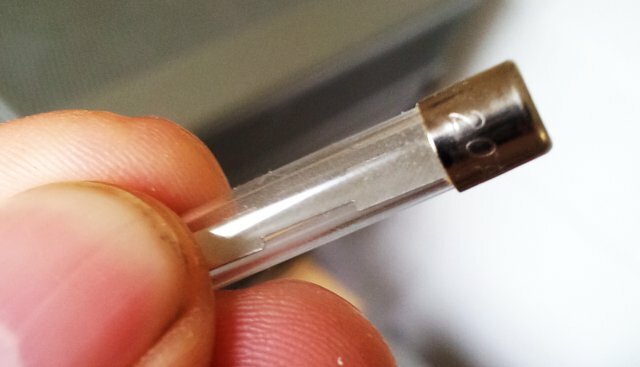 Well, there might still be some tiny difference of the original, HP branded ‘normal blow’ fuse, but test shows that a regular 3 Amp AGC ‘Fast Acting’ fuse is working perfectly find. So for the time being, we can just consider ‘Normal Blow’ and ‘Fast Acting’ fuses to be identical. How easy would be the world, if all things were build according to common, well-established standards. At least, for the fuses. 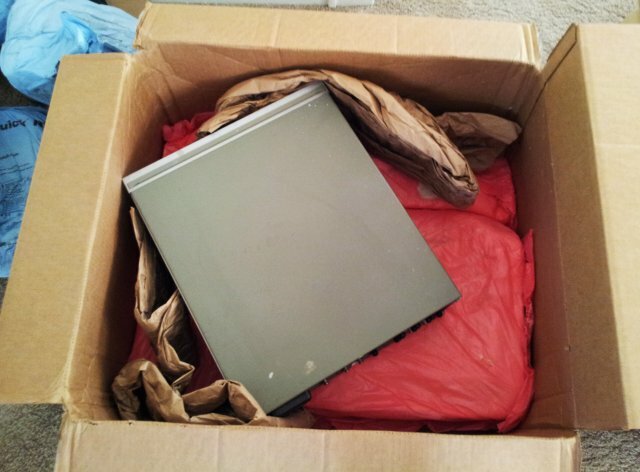 Should you ever send in any instruments for repair, please ensure it is properly packaged! 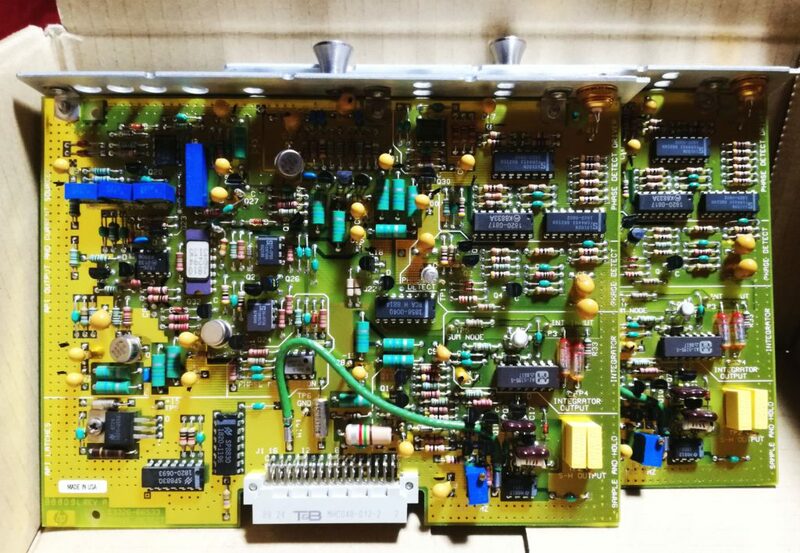 This defective 3326A dual channel synthesizer arrived with no major transport damage, but only due to luck, not due to proper packaging. First, let’s open up the top panel, and have a look inside. 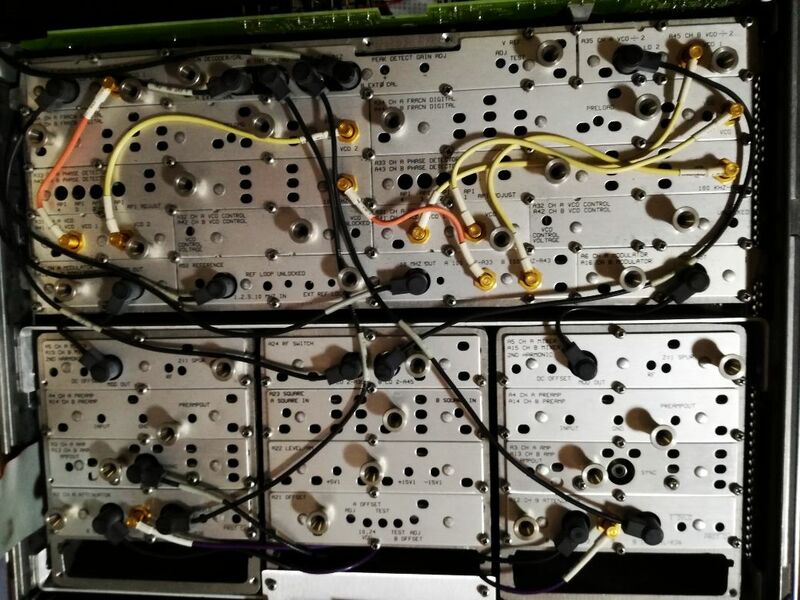 There are two complete synthesizers in the box, similar to the massively popular 3325A design. The synthesizers can be combined, for various two-tone operation modes, phase-shift and PWR modes, two-tone sweep sources, etc. 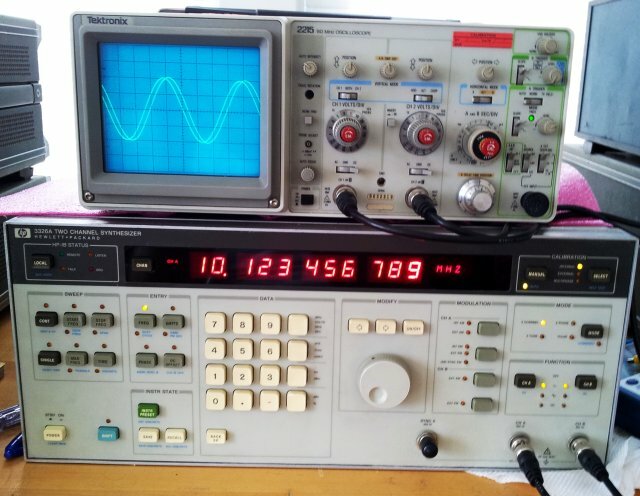 This makes the 3326A a very hand instrument to test all kinds of mixers, receivers, amplifiers. 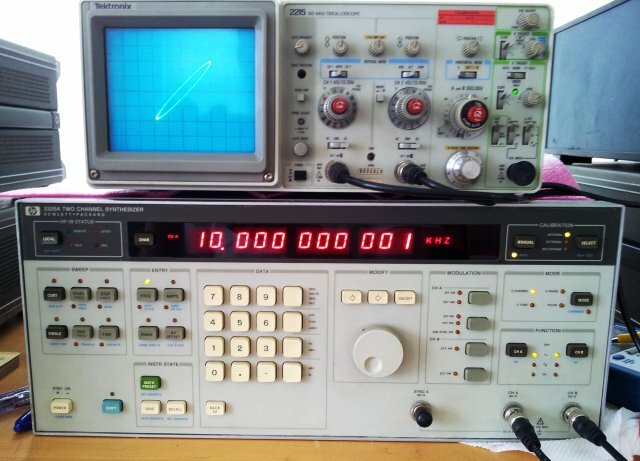 The outputs are extremely precisely frequency settable, down to 10-6 Hz in the kHz region, and 10-3 in the MHz region… that’s 1 part in 10+9, so you can simulate small oscillator drifts – the frequency stability of the current unit is excellent, it features an option 001 OCXO, +-10-7 per months drift. The 3326A is also great sources for modulated signals, having all kinds of internal and external modulation sources, including phase modulation. 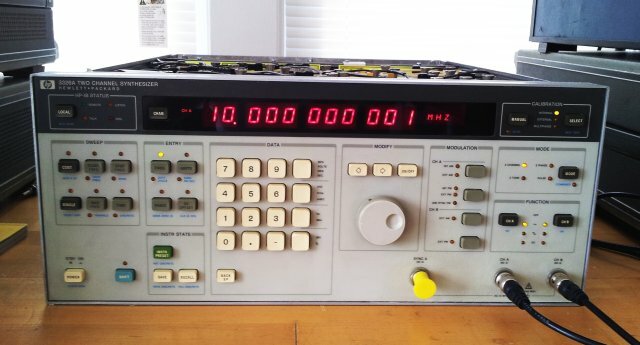 This makes it very useful for PLL characterization, phase detector characterization, or similar tasks. Well, in priciple. The current unit arrived in dead condition. Plugged it in – a bit of smoke, and bad smell, that’s it. 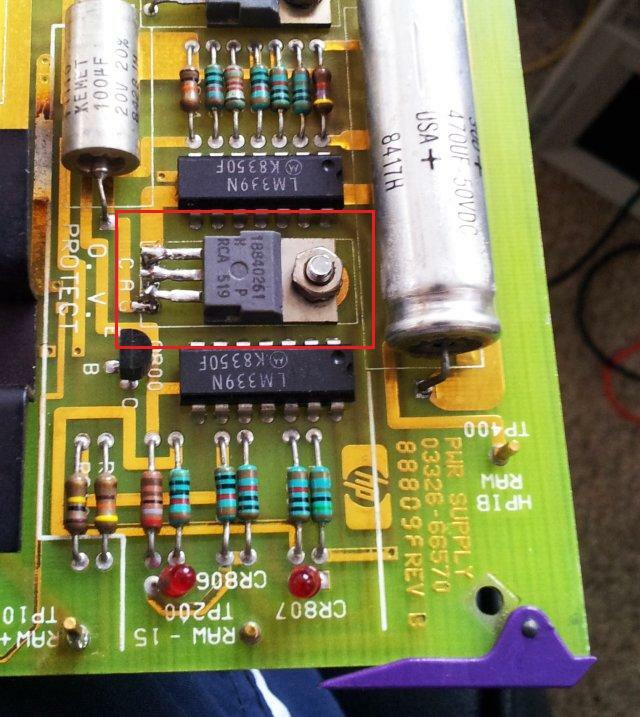 The faulty assembly: the 03326-66570 power supply. Another issue: No service manual!!! There are 100s of HP service manuals around, but none of the 3326A!!! Very disappointing – if you have one, PLEASE LET ME KNOW! Your help will be highly appreciated! 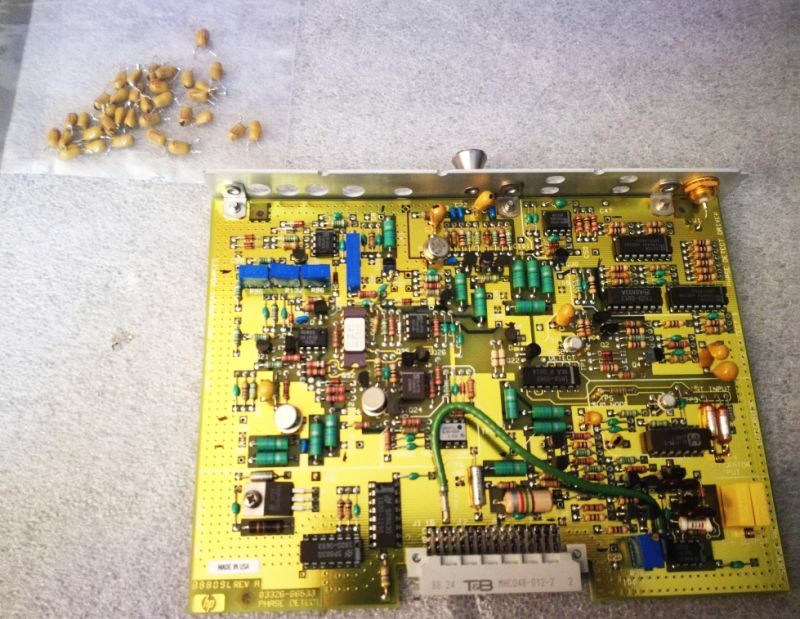 Someone must have tried to fix it before, because a few parts are missing – a screw, attaching the capacitors to the case, and a SCR (aka, thyristor), of the over-voltage protection circuit, CR800. 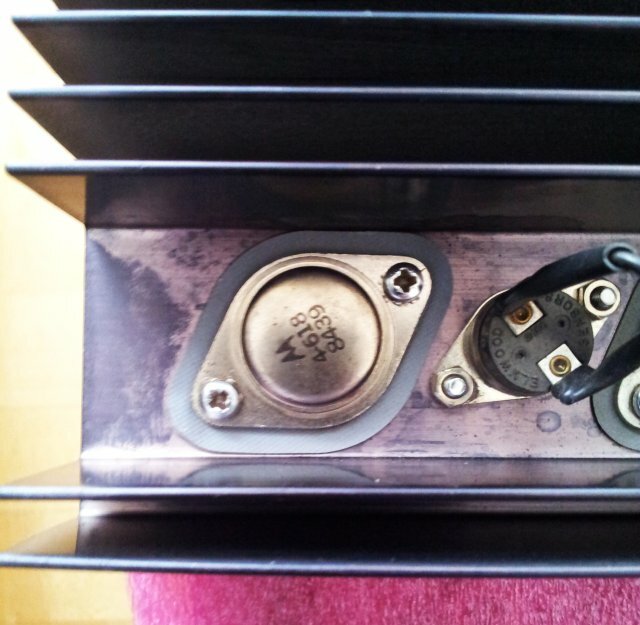 First fix – the ‘smoking’ capacitor, C706. 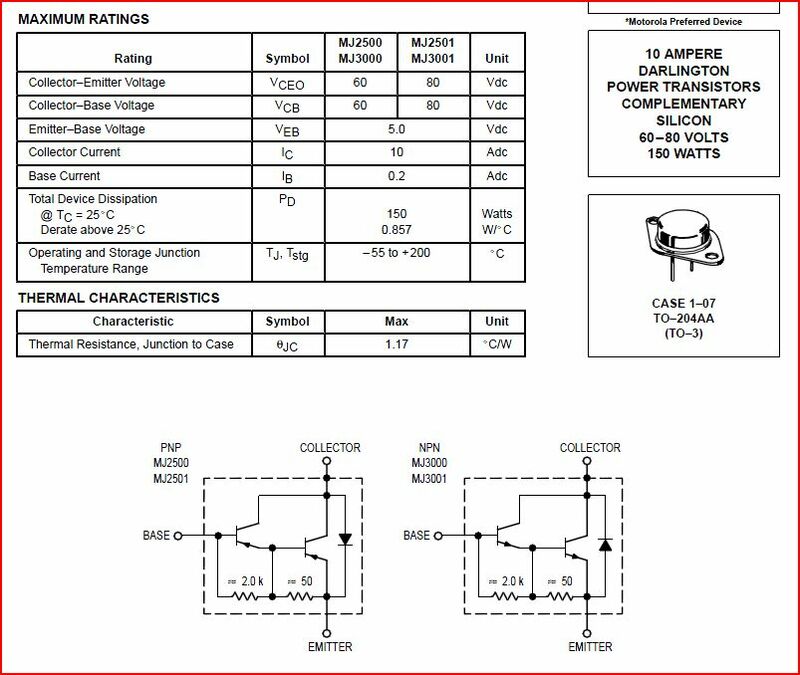 A 100 nF ceramic cap, at the input of the rectifier – actually, running with about 50 V AC, and a cap, rated at 50 Volts… no idea why HP was doing this – typically, they employ a large safety margin, when designing the circuits. Not it this case, and not to the benefit of reliability. 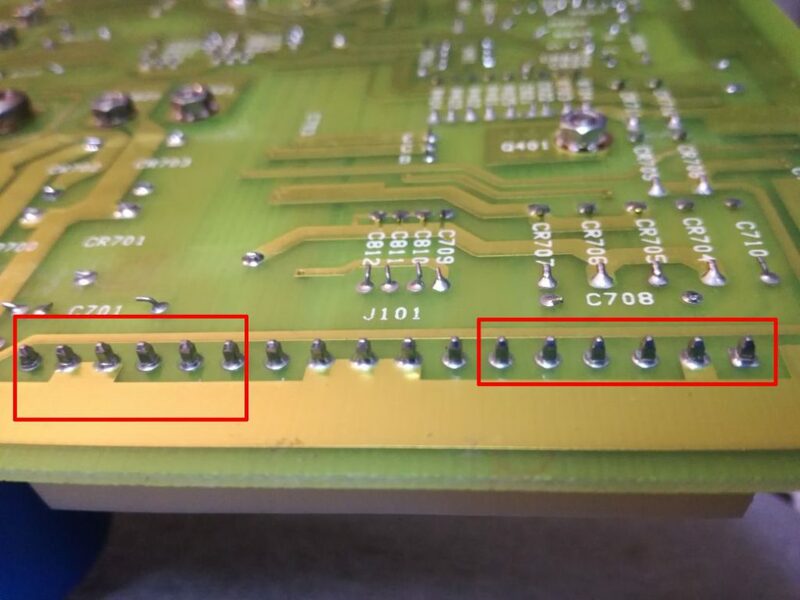 Unfortunately, the cap heated up the traces, and damaged the board – so I removed to loose traces, cleaned it up, and soldered the a replacement cap to the bottom of the board. 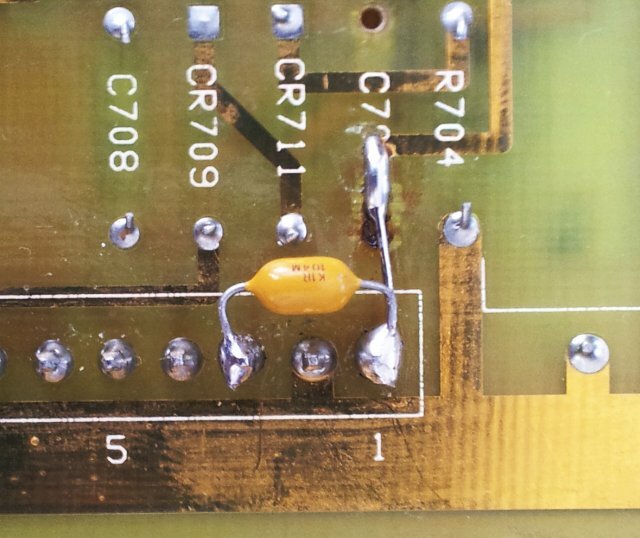 The protection circuit – the board was missing the CR800 SCR when received – I can’t find anything wrong with the voltage sense circuits, formed around two LM339 comparators. But there are burnt traces that show that high current must have been flowing throught the SCR at some occasion in the past, possibly due to an over-voltage condition on some of the rails. And the former owner of the device didn’t bother to put a new SCR back in. 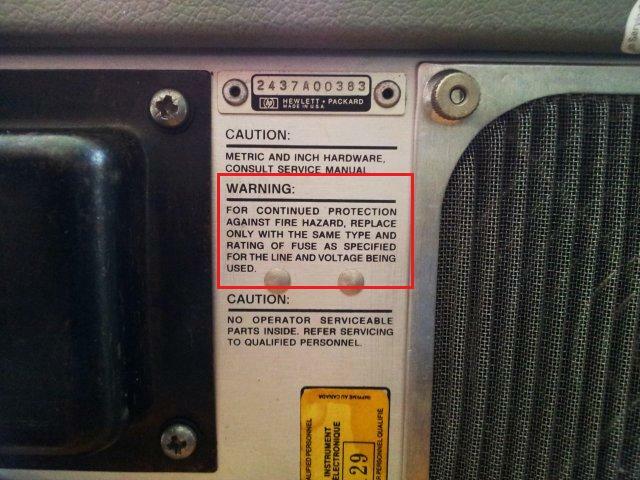 Fair enough, put a spare 1884-0261 back in, a 100 V, 4 Amp on-state RMS current. 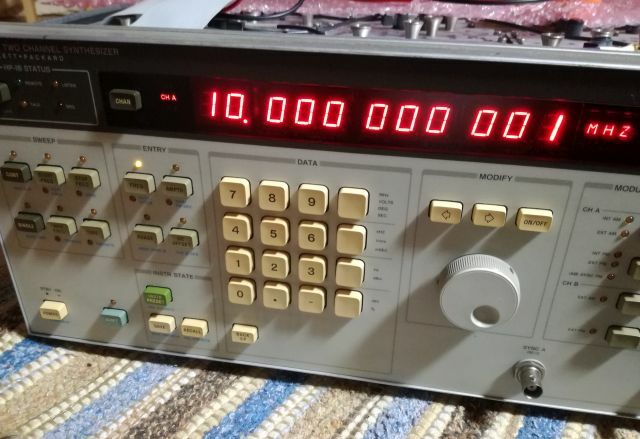 Will replace it later, either once I found out the original part number from the service manual, or once I get hold of a 100 V, 16+ Amp, TO220 device (which rest back in the main workshop, in Germany, while I have to get the 3326A going here at the US East Coast). 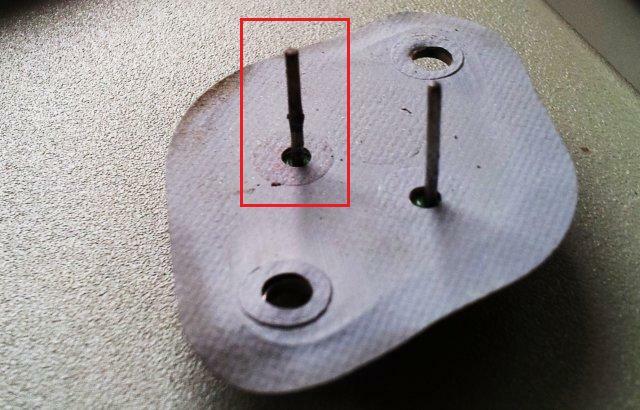 While inspecting the power supply, also noticed that the J101 connector – the main connector to the transformer – had several bad solder joints, seems the plating has come off the pins, making bad contact, even leading to head being generated. 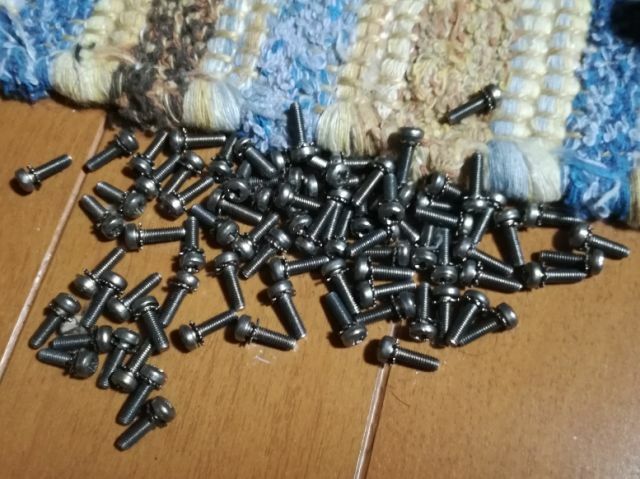 Resoldered the pins with big blobs of solder, not my usual style, but should work fine here to distribute the current more evenly. Now, the moment of truth…. 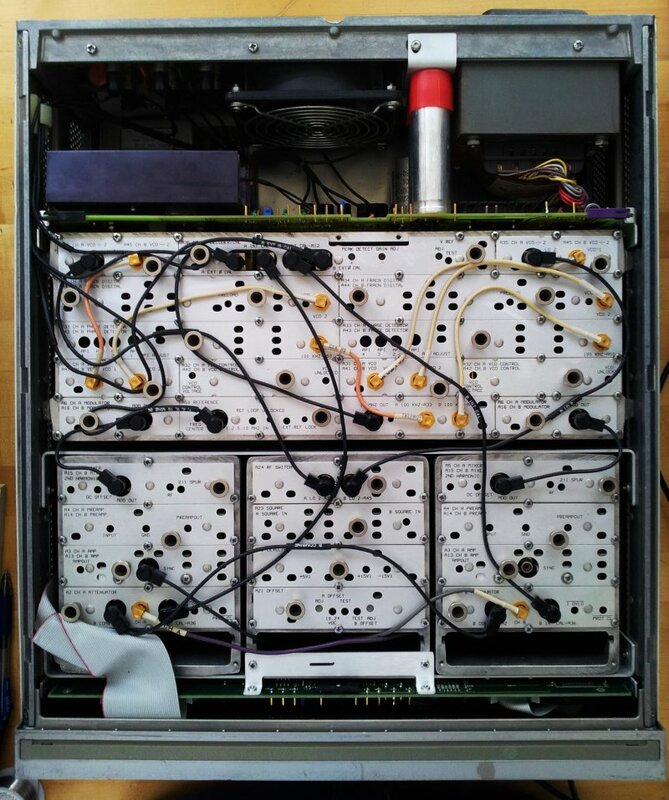 switched it on, and, all rails are up (you can use the little jumper on the board to operate the supply outside the slot – don’t destroy your instrument by putting back in an untested power supply assembly!). …it works! Seems we have won, and still some years to go before this instrument will turn into a paperweight, or, well, a doorstop. As usual after repair, now, running it for a few hours, switching it on and off a few times – checking the stabilty of the output. Not so good news. Sometimes, instabilities show up, and after a few power cycles, it doesn’t come on any more. Then, it comes on again – an intermittent fault! Never good! Good advice, in case of intermittent faults – let them develop into permanent faults, and in this case, watch the ‘power good’ LEDs of the various rails. 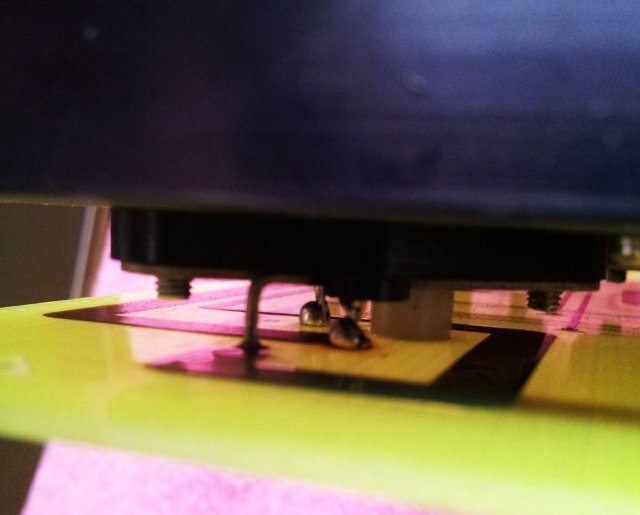 After a bit of probing, knocking, knocking, pushing – found the issue to reside with the 5 V rail. 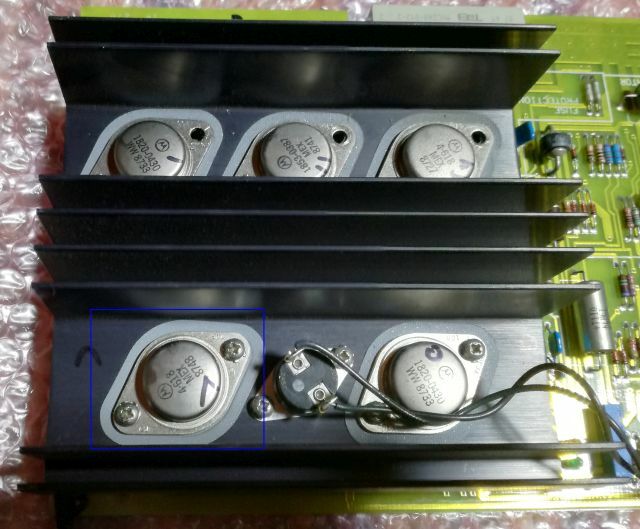 Even without the service manual, a few tests of the voltage regulator shows that the regulator working, what is not working, is the series pass transistor, a HP 1854-0618. This is a re-branded Motorola MJ3000. 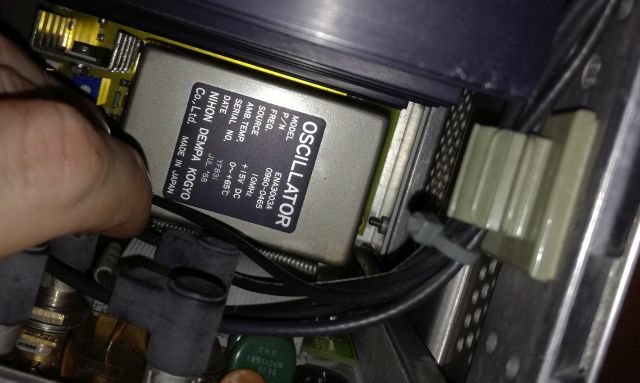 Now, things are clear – the 5 V rail is quite high current, and the pin-socket combination (for the emitter pin) just isn’t made for it, well, at least not after 30 years of service, oxidation, and so on. One day, it must have heated up quite a bit, judging from the state of the contact. No way to fix this by just cleaning it up – the contact is all soft, and won’t provide a low resistance path. 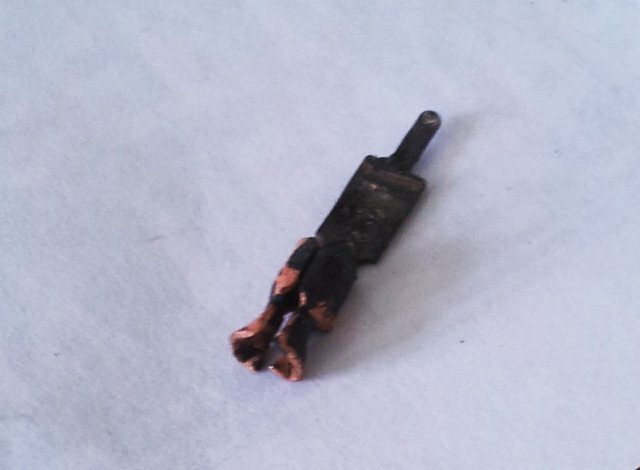 So, I removed it alltogether, and soldered in the pin, using some tin plated copper wire. 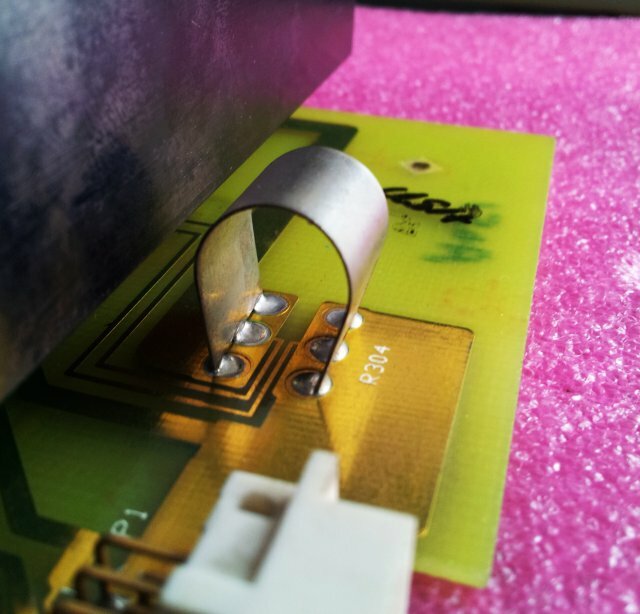 Also noticed some discoloration of the via at the emitter pin – the heat caused some damaged, but not too much, and also here, added a large blob of solder, to ensure good contact both sides of the via. Talking about the obvious engineering weaknesses of the power supply, also some good things – it actually has several protection circuits, all rails are protected by heavy Zeners (which will short when overloaded), plus the active monitoring-SCR circuit. For the 5 V rail, even the current is monitored, by this rather fancy shunt. Gave it another few hours of run-in, and numberous power cycles, still, all is working just fine.